Mahoney's Seafood has specialized in crab feeds for fun and fundraising events for over 30 years. Crab feeds are one of our specialties. We work with organizations throughout Northern California to make sure they have the best Dungeness crab available for their events. Our quality and prices are unmatched. Mahoney's Seafood is a family run company built on a foundation of personalized service and in-depth product knowledge. Jerry "Mahoney" Jones began his seafood career as a commercial crab and salmon fisherman in the 1960's. His experience taught him the true meaning of "fresh from the sea." Besides his love of fishing, Jerry has a love of fine food, well prepared, and he has worked with some of the finest chefs in San Francisco and Sacramento. His knowledge enables Mahoney's to secure seafood from a variety of local, national and international suppliers. Crab is hand cracked for each order. There are several different styles of "crack" or ways the crab comes when finished. This is the most popular style of cracking. Bodies and legs are separated and each leg cracked individually. Boxes come with the bodies and legs separated.. The cioppino crack style divides the crab body into four sections and the legs cracked. This is the style used most often in Cioppino seafood stews. It is popular for many crab feeds because each portion contains body and legs. Crabs are divided into two pieces and the legs are cracked. 1. Set event goals. Examples of goals are: to raise funds, to have an enjoyable social evening, or to celebrate a special event. 2. Decide how many attendees you want to accommodate. 3. Find a location that will accommodate your group. Some considerations are:. does it have a kitchen; are alcoholic beverages allowed on the premises; is it available on the dates(s)/times that fit your group's calendar? 4. Set the date. The best times of year in terms of price and quality for crab feeds are December through March. 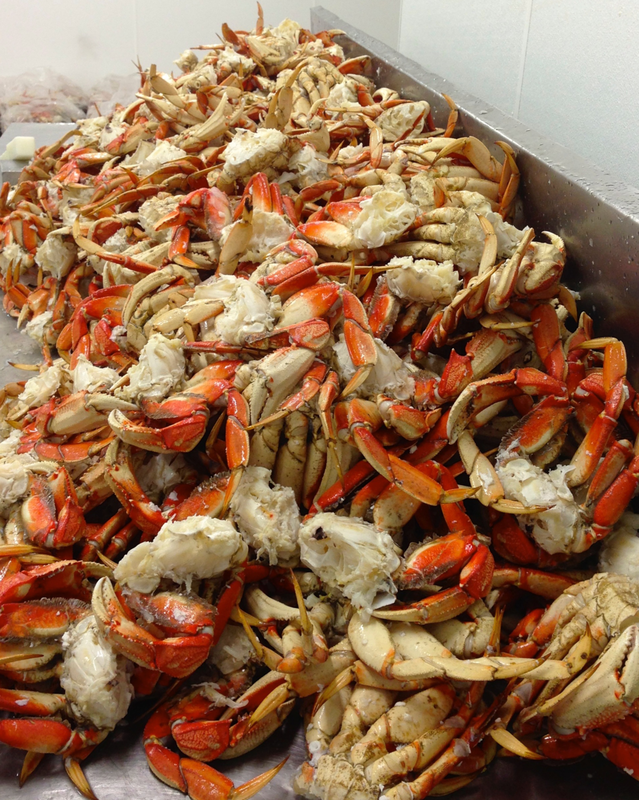 Crab is available year round, but the main West Coast Dungeness catch is from the middle of November until the beginning of May (depending on mother nature and the Depart of Fish and Game cooperating). 5. Other Seafood items, such as prawns and salmon are good choices for the spring, summer and early fall months. Several groups we work with have prawn feeds in the summer and report happy members and successful events. 6. Plan the activities. What is included in the evening is up to the group. Often groups who are using the event as a fundraiser have raffles, silent and live auctions, etc. along with the crab feed. Many groups have dancing after the feed. 7. How much crab to order? Most groups find that 3 lbs. per person is about right. If a group is offering a more elaborate menu, then 2 1/2 lbs. per person might work. Crab is ordered as "whole cooked" crabs. It is cracked and cleaned to order. The pricing is based on the whole cooked crab weight. The final delivered weight is about half of the weight of whole cooked crab. Remember, the back shell and the inners of the crab will be removed. 8. Cracking style: We crack crabs to order, so we can crack your crab in the style you prefer. There is a page with some popular examples. 9. For the chef: Crab is delivered ready to serve. While some groups prepare individual portions for each diner, most of our groups set out bowls or trays of crab in family style service. This is more of an "all you can eat" style, We do not suggest advertising "all you can eat." Some people take this as a challenge and forget the purpose of the event is to raise funds or to have a good time. They think they are supposed to set a crab eating record. This isn't good for them or your group. 10. Crab is delivered double bagged in boxes with ice bags. The boxes have plastic liners to help contain the ice and melting water. 11. It gets easier if your crab feed becomes an annual event. Your members and community come to expect and look forward to it and it usually becomes more successful each year. The first time is definitely the hardest. Isn't that true of most things? We are sure we've left out lots. Please feel free to call and chat with us. Most of our customers are referrals and become friends through the years. Besides being in the seafood business for over 30 years, we have been personally involved in doing fundraising events for our kids schools, sports teams, and church. While we are not experts at fundraising, we have found that the most funds are raised when an event also raises fun! email us at info@mahoneysseafood.com OR call us at (916) 635-9500. 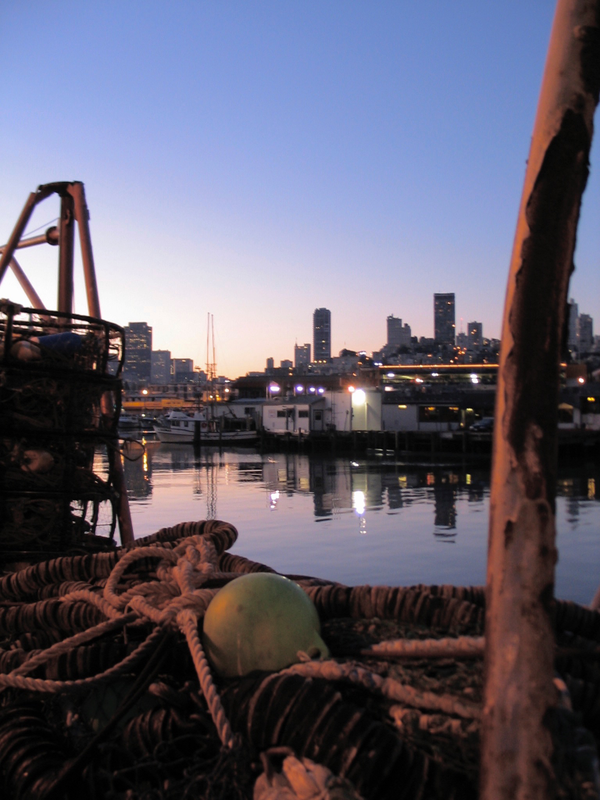 Mahoney's Seafood has a history of providing quality seafood to fine restaurants and markets throughout Northern California from San Francisco's Fisherman's Wharf and our processing plant in Rancho Cordova. We consult with our customers as they plan their menus so they will have the high quality fish and shellfish items they need at competitive price points. Jerald with Alaskan Halibut he caught in Seward. Mahoney's has hands on product knowledge. Jerry "Mahoney" Jones began his seafood career as a fisherman working out of San Francisco's Fisherman's Wharf and Point Reyes. Jerald is an expert at fish filleting. Both have personal knowledge and extensive industry contacts that help them guide customers in their seafood choices. Much of our product is hand filleted to order. Jerald shares the bounty with a text update on this day's offerings. Jerald texts a picture of filleted fish. All cleaned up and ready for the start of a new day. We follow strict guidelines when it comes to handling seafood to ensure the highest quality and food safety. We are registered with the California Department of Health, Food and Drug Branch as a licensed food processor and maintain our Shellfish Handling and Marketing Certificate (Cert # CA-554-SS). We are also licensed by the California Department of Fish and Wildlife as a Multi-function commercial fish business. We are HACCP compliant and have a HACCP plan on file. Not only do we sell seafood, we fish for fun. If you want a lifetime of insider knowledge of San Francisco Bay's bass hot spots, just ask Jerry. When asked how he knows where to go, he replied "I just think like a fish." Jerry catches a Striper on San Francisco Bay.